Thanks, Mom – A special moment of gratitude charms the world. A special moment of gratitude charms the world. Keeping a secret is hard. It’s exponentially more difficult when you’re paralyzed from the shoulders down and the one person you’re trying to keep the secret from is your near-constant companion and helper for your phone, laptop, email and, well, everything. 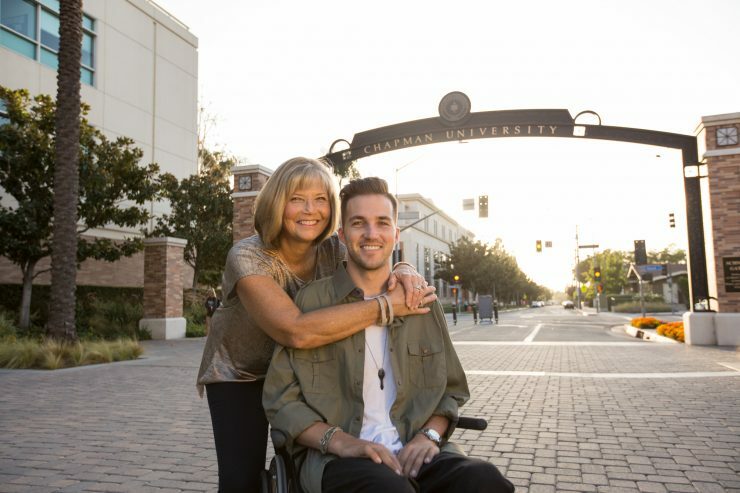 So when Chapman University President Daniele Struppa welcomed MBA student Marty O’Connor and his mother Judy into his office in the months before Commencement last spring, O’Connor asked if he could meet with Struppa one-on-one. O’Connor wanted Chapman to consider awarding an honorary MBA to his mother –“Marty’s assistant,” as she introduced herself to professors. Judy O’Connor attended every graduate school class with him – taking notes because he could not, raising her hand when he wanted to make a point or ask a question and then rolling him to his next class or driving him home. “I told President Struppa that were it not for her efforts there is no way I would be in the position that I was in, nor would I have achieved as much success,” says O’Connor, 29. The plan he proposed would require stealth. “I wanted to let them know not to email me with the subject line ‘Your mom’s honorary MBA,’” O’Connor says. “If there was anything to talk about, I wanted them to call me or set up a face-to-face, because under my circumstances, it’s hard to maintain that kind of secrecy.” Struppa loved the idea of giving Judy O’Connor an honorary degree, but there was more to be done. Video of Judy O’Connor receiving her surprise honorary degree at Commencement. On May 20, Commencement day for the Argyros School of Business and Economics, Judy O’Connor rolled her son up the ramp onto the stage, accepted his diploma, placed it in his lap and stepped away, trying to get out of the photo. But Argyros School Dean Reggie Gilyard, presiding over the school’s Commencement for his final time before stepping down as dean, reached out and took hold of Judy’s hand. The emotion of the moment overtook announcer Cristina Giannantonio, Ph.D., an associate professor of human resource management. Her voice choked up as she awarded the honorary degree until she finally exclaimed, “Oh, shoot!” – her reaction so genuine that news reports almost inevitably mentioned it. Judy O’Connor’s poise never seemed to break, and she blew a kiss to the crowd as she pushed her son’s chair off the stage, though she says there were tears behind that smile. The secret wasn’t a secret anymore. And within days, something unexpected happened: The story of the MBA quadriplegic and his mom went viral, becoming an international news and social media phenomenon. By the time it died down several weeks later, the O’Connors had been featured by ABC World News Tonight with David Muir, NBC Nightly News with Lester Holt and the Today show. It was in The New York Times, Los Angeles Times, People magazine and the British outlet the Daily Mail. “I was talking to people from Germany, Canada, all over world,” O’Connor says. More than 375 online and print outlets and more than 550 television and radio stations ran the story. NBC Nightly News’ coverage of the O’Connors’ story. 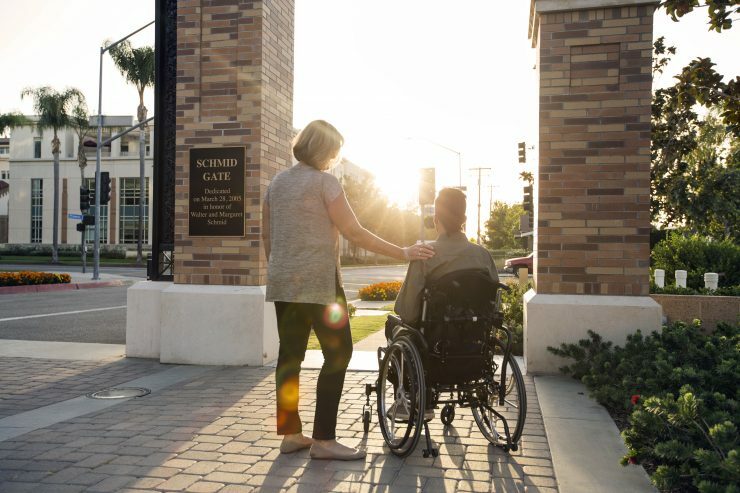 The mother-and-son media blitz didn’t end for three or four weeks, with multiple daily interviews and repeated trips to Chapman for camera crews that wanted to film the campus ambience – trips that are never easy because of the time-consuming process of getting O’Connor ready and loading him and his wheelchair into their specially designed vehicle. “We were so happy to do that. 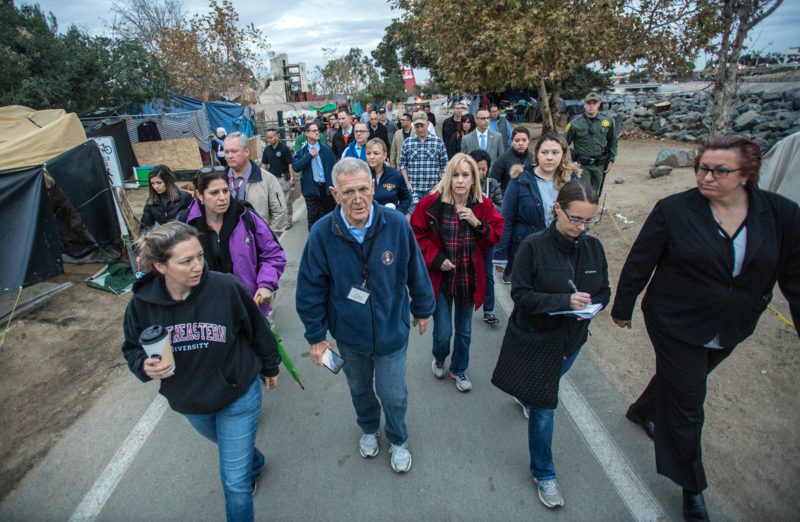 We were riding the wave, in the moment,” Judy O’Connor says. That was the most unexpected surprise: A son’s plan for his mother put Chapman on millions of television and computer screens, and the story was shared on social media more than 15 million times. And none of it was intended or even imagined when Struppa heard O’Connor’s quiet proposal in his office. “You know, I have been around for 62 years now, and as you grow older, you tend to become a bit cynical, and all too often you see how well-intended actions are being punished or taken advantage of,” Struppa says. “So, it was truly a wonderful surprise to see that our action was not misunderstood, and was in fact hailed as a positive moment. After a nearly month-long media blitz, on top of the demands of two years in graduate school, Marty O’Connor needed a summer break. “(Grad school) took so much, not just mentally but physically,” he says. Los Angeles County to engage youth in entrepreneurship and the arts as well as sports, he has connected two of his passions: action sports and entrepreneurship. For now, Judy O’Connor remains his primary caregiver, or “domestic engineer,” she says with a laugh, with assistance from her husband, Marty Sr. Judy had been teaching elementary school in Florida in 2012 when Marty was paralyzed by a fall down a flight of stairs in Newport Beach. So began the journey that took her and Marty to that cap-and-gown day in May. Marty O’Connor is navigating work with the skills he learned in graduate school, and seizing some of the new opportunities that have come his way. On a Saturday morning in September, he sat in his wheelchair in front of a small group inside a contemporary warehouse space in Long Beach. The former action-sports athlete was giving a featured talk for a session with fitness entrepreneurs and aspiring speakers organized by Mike Matuz ’07, CEO of First Step Fitness and O’Connor’s mentor in the Chapman50 alumni networking and leadership program. His own prospects as a speaker have burgeoned after his run as a media darling clarified that he has poise and polish to go with an inspiring message. Other opportunities have appeared, but those – including the possibility of a book about his experience – are on the back burner for now. O’Connor drew laughter from the group when he mentioned his bottom-scraping GPA his freshman year at the University of Colorado after he discovered the nearby snow and social life. But he told the audience how he rallied to graduate on time. And then, how he metaphorically picked himself up after his crushing fall and started over. None of it would have been possible without the choice he and his mother made to work together. “We made a decision to turn my adversity into my advantage,” O’Connor says. “Our journey together provided us with a purpose, intellectual stimulation, and one hell of a way to spend more time together. Tony’s Story – Chapman War and Society student Judy Richonne (M.A. ’18) helps give voice to a Silent Hero of D-Day.